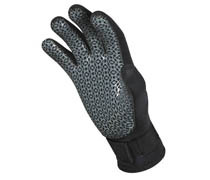 Warm 3 mm gloves with a really good grip on your paddle. Pre-curved fingers and really sticky palm pattern. Adjustable elastic at wrist for a better fit.